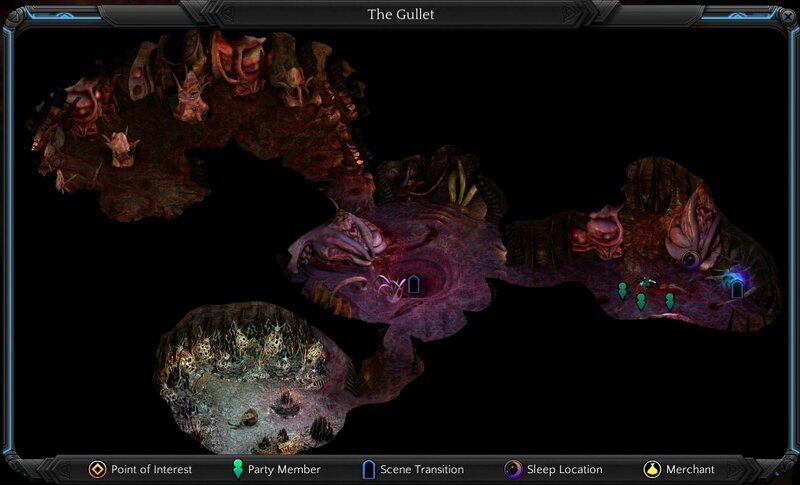 The Gullet is a location in Torment: Tides of Numenera. Some combatants are fighting each other near the entrence, they will attack you if you get too close. However you can communicate with Tongue Cluster nearby, use tidal surge to force it transport thoese combatants to somewhere else. Interact with Tongue Cluster in southeast room will reveal another Maw, persuade Siowan to offer himself to this Maw opens a portal to Chamber of Bones. Some combatants will attack you in the room on the left. Use spray on right and bomb on left, even tho u can use either on right, cuz left only accepts bomb n if u waste it u have to get synth egg.